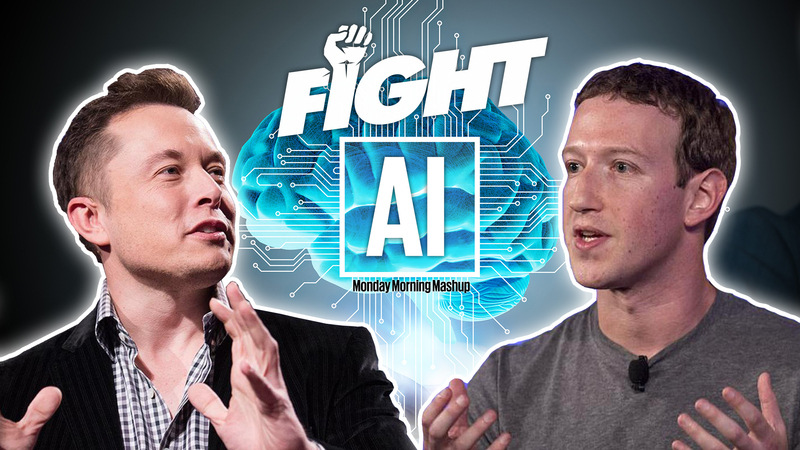 Musk and Zuckerberg go head-to-head on AI. Two of Silicon Valley’s biggest tech titans have taken off the gloves, and are having a verbal sparring match around Artificial Intelligence (AI). Mark Zuckerberg came out and criticized Elon Musk for saying “artificial intelligence is the biggest threat we face in civilization.” The Facebook CEO chastised the Telsa, Space X CEO saying, “I think people who are naysayers and try to drum up these doomsday scenarios – I don’t understand it. It’s really negative, and in some ways, I think it’s pretty irresponsible.” Musk, who has deep experience with cutting-edge AI through his many ventures (think Telsa’s self-driving vehicles and Neuralink’s efforts to link people’s brains with computers), shot back on Twitter at Zuckerberg’s remarks with, “I’ve talked to Mark about this. His understanding of the subject is limited” – Ouch! Yes, my friends, this is a hot topic. And it’s worth considering both sides. We’re getting exceptionally cozy and reliant on the ever-helpful and handy AIs that live in our smart phones. We know these AIs on a first name basis – Watson, Siri, Alexa, Cortana and many other familiar characters (notice how they all have nice human names). And we truly value advances being made in medicine, transportation, communications, and education – just to name a few areas where AI has vastly improved how we operate. Yet, when I think about famous first name computers, it’s hard to shake my uneasy impression of HAL (from 2001 A Space Odyssey), who was oh so helpful until ‘he’ saw humans as inefficient viruses that needed to be eradicated. And lest we forget other parables for our generation, such as The Terminator’s vast human exterminating Skynet, and the dreadful human energy pods of the machine run virtual world depicted in The Matrix. That said, we’re securely on this AI track, and we’re not getting off whether we like it or not. We need to solve cancer, Alzheimer’s, poverty, access issues – the leading challenges of our time – and AI will do this for us. We currently stand at the forefront of this development and we want AI to get smarter. Yet, once AI talks directly with other AI, we need to be assured that humankind will always be protected. How we regulate and structure AI in these early stages will be pivotal. The value system that we initially program will determine how AI treats us in the future. So we need to be smart and lay down a protective template that will allow us to thrive in the world together. You’re my friend – right Siri?